Can Fix-a-Flat Really Get You Out of Changing a Tire? Fix-a-Flat is an emergency tire repair kit that is designed to get you back on the road without having to replace your tire with the spare. It’s supposed to be a one-step tire inflater and temporary repair system so you can get to the tire shop. But how well does it work? It only takes one instance of changing your tire in lousy weather conditions to make it so you never want to do that again. That is the painful memory that drives many to find a way to fix a flat quickly and get back to driving as soon as possible. The leading brand of emergency tire repair is Fix-a-Flat, but just because something sells well doesn’t always mean it’s reliable, so we analyzed what people are saying to see if it’s something you can depend on when you’re having a bad day. They claim that with the Fix-a-Flat product you don’t have to worry about using a jack, lugging the spare tire, or removing the damaged tire. It inflates the tire and seals up the damage long enough so you can make it to a car repair facility. Even though they never say that this is anything close to a permanent fix many users still complain that it doesn’t fix the tire for long. They’re pretty straight up about it being a temporary fix, and the main focus should be on the feature that it gets you out of changing the tire. Nobody likes the thought of being stranded on the road with a flat tire, trying to fix things while traffic whizzes by you. It’s actually pretty dangerous, since most people don’t carry flares in their car, and others might not notice that you’ve pulled over and could pass by very closely. If you’re physically unable to change a tire you’d pretty much have to call a towing company even for the most minor leak to your tire. This is a way to potentially help those that can’t change a tire, and those that don’t want to. There are several different types of Fix-a-Flat available. They have their advanced formula which is phasing out the original formula. You can still buy the original and it goes for around $13 shipping to your door. Most would agree that this is a nominal fee and something that you could put into your car as part of an emergency repair kit. This should reduce the work you need to do in the event that you blow out your tire. The reviews are in on Fix-a-Flat, and they suggest that it’s definitely something to have in your car, and it can get you out of a jam in many instances. It’s important that you follow the directions exactly, which might be hard to do if you’re frazzled or caught in a downpour or a bitterly cold night. It’s also good to realize that this is by no means a permanent fix. It’s only designed to get you off the road and into a service station. You don’t want to drive around on the tire for too long after fixing it. Some have complained that the product ruins the tire in the process, and others have suggested that it can start to ruin parts of the wheel as well. But it’s not meant to stay on your car for long. Most people are happy to have avoided having to change their tire on the road, and don’t mind replacing the tire when they get it serviced. However, if you are worried about this you might want to try a competing product called Slime that doesn’t damage the tire and allows the repair shop to simply patch up the tire and send you on your way if it’s just a minor leak. The Fix-a-Flat kit is getting our Thumbs Up rating, and we recommend getting one and putting it in the trunk of your car. You’ll still want to keep the spare tire in there too, even just a donut because there is some damage to the tire that this won’t work for and you might still need to change a tire in some instances. But your first step would be to see whether or not you can fix it quickly with Fix-a-Flat. When it comes to emergency situations you can’t be too covered. Having AAA or some other roadside assistance in place is recommended. In case you can’t get the leak fixed you’ll want a service to be able to come out and help you, either by fixing the tire or towing your car to the nearest service center. But to save time it’s good to have an array of tools available so you can try to fix it yourself before calling in backup. What do you think? Does Fix-a-Flat work or not? Does Easy View Really Work? Does Fast Glass Windshield Repair Really Work? 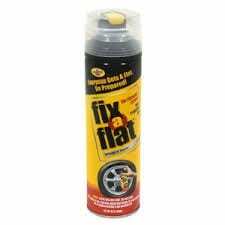 I’ve used fix a flat several times and I usually find it works great, providing the leak is just from a puncture. It won’t work on a slash cut, of course. And I’ve had it work for six months, so it lasts a pretty long time. In fact, I used fix a flat six months ago in the tires I just replaced and I only had to replace them because the tread was worn out, not because the fix a flat stopped working. The only downfall is that if you do have a puncture and you use it, it becomes VERY difficult to fix the hole properly. And, most tire places HATE opening up your tire and finding that “Green goop.” Fix a flat is great if you have to get going and keep going. But, if you do have a puncture and you want to get it properly fixed, you’re better off switching to the spare and taking your tire in to be fixed ASAP, rather than using the fix a flat. I’ve never had this happen, but I have heard there are even tire shops that will charge extra if you have used Fix a flat and you ask them to fix the tire properly. So, that’s something to keep in mind. My advice is that if you have a puncture and you’re planning on replacing the tires in a few months anyway, then by all means, use Fix a flat. If you’re in an unsafe situation where you have to get that car out of there ASAP, use Fix a flat. But other than that? Do it the old fashioned way. Hey thanks for the review! I love user reviews because they’re the most accurate and unbiased. I’m gonna have a can of Fix a flat in my trunk at all times for emergency and it might come in handy (I hope not) since I’ll need to change my tire in about 6 months anyways. Hopefully I won’t get a flat at all, but if I do I know I’ll get to fix it quite easily. Fix a Flat definitely works. Not only do I keep a can in my car at all times I made my daughter put one in hers as well. I had a flat tire one morning when I was going out to my car to go to work. I have a spare tire, but my son couldn’t find the tool needed to take the tire off and his cars didn’t fit on mine. At seven in the morning you don’t have a lot of choices so he went to the gas station and bought a can of fix of flat which allowed me to take my car to the tire repair shop and have the tire changed and fixed. I put the flat tire that I inflated with fix a flat into the truck and I looked at it the other day and it is still full of air and that was over a month ago. The price is amazing at six dollars. Everyone should have a can for emergencies. Fix a flat has never worked for me.. I’ll go pick up a new can tonight from the local WalMart since my project car has a slow leak so I can get to the tire shop.. As of current, my opinion is very poor of the product. Had two cans in my trunk for use in case of emergency. Woke up to a flat this morning and neither can worked. Very disappointed to say the least! USED 2 CANS ON THE SPARE TIRE THAT WAS TOTALLY FLAT. did not own the car so left the spare with fix a flat on the car. Was still holding air 3 years later when got rid of the car. BUT, had 2 cans left in another car trunk for couple of years and neither can worked after being left in the trunk for those years. I think that in the northeast where temps range from 100 in summer to below zero in winter the contents expire. Maybe a new can must be purchased annually? I think this would probably work on bicycle tires, and I know it used to work 20 years ago because I used it several times. BUT, the last 4 times I tried it, two times the hose broke off making it useless, and two times the can ran out of pressure with the tire essentially still flat, with only 10 to 12 pounds of air in the tire. I couldn’t drive like that, so I had to change to the spare anyway. Whatever changed from the good old days should be changed back. It’s pretty near worthless, as is. My daughter had a flat tire and used fix a flat . When she was at tire Rama she told them she used that they did not want to patch it and told her she need to get a new tire. I am shocked.The hole was not big pretty small.